For the rest of the world, everything seems normal again. There is no black and gray smoke billowing into the sky over Nederland, there are no flames shooting out of the trees. Our house looks exactly the same. Life goes on, right? I’m having a hard time talking with friends and co-workers outside of Nederland. They have this automatic assumption that everything is fine now. Our house is fine, the fire is gone, we must be fine? Yet, I don’t feel fine. I feel brittle, like glass. I’m hanging by my claws, trying to keep a grip, to keep it together. Yet, I feel as if at any moment, I might break apart into a thousand, tiny pieces, shattered all over the ground. I’m just seconds away from tears running down my face. Today, I returned back to work for the first time. When I took a job working in Nederland, I was so happy to be so close to home, how great to have a 10-minute commute! In the back of my mind, I also knew it could come in handy if a wildfire struck to be able to quickly dash home to get the animals. And I am so grateful for being able to get in to get them out. But today, that short commute didn’t feel so great. Because every day, twice a day, I will be driving by the charred remains of people’s homes, and pass woods that appear to be nothing but burnt match sticks, a barren landscape devoid of all life. Bright orange stains the pavement every few hundred yards – reminders of the slurry drops made by air tankers to try and save homes. And every day, I’m reminded of this horrible catastrophe and the chaos and stress it brought our lives and our neighbors. It all just seems too much to bear. My neighbors feel it too — their tired faces belie the lack of sleep over the course of a week. One says she’s terrified to leave the house to leave her pets behind in fear she can’t get back in time. This afternoon as I work in Nederland, the sound of a siren pierces the air and I noticeably flinch. I see a fire engine race through the circle. Did another fire start? 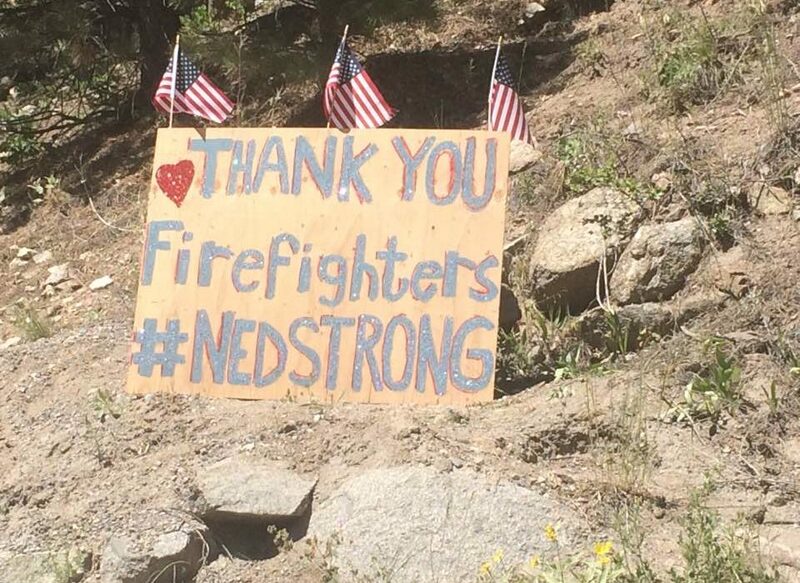 The only thing that brightens my day as I drive back home are the signs, the many signs acknowledging the heroic efforts of the fire fighters. “Nederland thanks you.” “We love you firefighters.” “Thank you for saving our homes.” Some scrawled on posterboard, some spray painted on pieces of plywood found in someone’s garage. I smile, and get teary-eyed all over again.